Mrs. Lacy's Magnolia House Tea Room was named after my grandmother, Mrs. Lacy Jones Coggins. She was one of eight children born in Apex and married Hurley Dolphus Coggins from Tramway, North Carolina. She had 15 children, 9 of which are still living. Grandmother and Granddaddy Coggins owned one of the first country stores in Tramway, called "Coggins and Son". They also had a small antique shop on Center Church Road. Mrs. Lacy, as she was called by everyone in the community, taught Sunday School at Grace Chapel Church for 40 years. 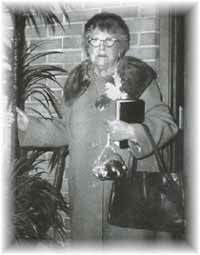 She loved to read, travel and visit yard sales and flea markets where she acquired most of her antiques. My fondest memories growing up were attending church on Sundays and eating lunch afterwards at Grandma Lacy's with the family. I remember her hats, gloves, jewelry and fox furs. She was someone I wanted to be like when I grew up. She was always happy, without a negative word towards anyone, and she loved the Lord. When I decided to open a tea room in Sanford, Dr. Margaret McLeod realized my dream too, and agreed to rent, and later, sell me her own house. She was Sanford's first Pediatrician and loved by everyone. The Tea Room is a charming Victorian two-story house, built in 1902. It first opened for lunch on December 1st, 1995. The menu consists of all homemade salads, quiches, specialty sandwiches, teas, coffee, homemade desserts, and a charming atmosphere of the delightful South. We specialize in Bridal Luncheons, Bridal Teas, Brunches, Children's Tea Parties, and Business Lunches. Lunch can be enjoyed in the sunroom, Magnolia Room, Victorian Room, Cameo Room or upstairs in the Purple Rooms. The upstairs hallway, Mrs. Lacy's Art Gallery, is filled with antiques and paintings furnished by the Brush and Palette Club. I'll look forward to sharing a hug with you!